"Another solitaire variant with animated graphics"
The card game presented here is called Spider Mania Solitaire. It’s another variant of this popular game you might be interested in to kill some time between tasks you perform on the computer, or just to play because you’re a fan of this game. The aim is to get rid of all cards performing the least moves possible, making up full suits from King to Ace. 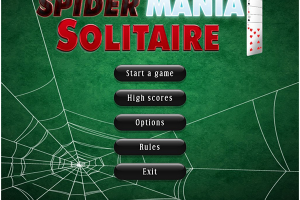 Spider Mania Solitaire features different modes, including an easy one to learn the rules while playing, a medium one and a so-called hard one. Without going into the details about its rules, we can tell it features sophisticated graphics that are animated and alongside this review a couple of screenshots have been posted in the images section so you can get a preview of how it looks like. If interested in evaluating this solitaire variant now, initiate its download.